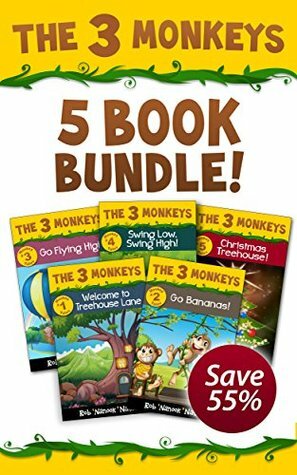 Great group of stories to teach simple lessons through the antics of 3 monkeys and their friends. In this first tale Booey, Hooey, and Fooey are looking for a treehouse to move into. They find an ad in the paper and go to meet the person in charge. They buy the treehouse without seeing it first. Will it be a great treehouse, or will they be sorry they bought it? The three monkeys and Kabooley take a trip to Coconut town. He teaches them how to cross the river by giving a snack to the crocodile and the turtle. But, when they get to the town they see three blue faced monkeys running toward them. Shortly after that they see some monkey cops coming to arrest them. Tale 4 – Kabooley to the Rescue! This is a continuation of take three. Kabooley ran back to track down the true robbers and bring them back to the jail. He needed to rescue his friends from jail. They found out how true a friend he was. Tale 5 – The Big BIG Day! In this tale we find our jungle friends playing in a soccer game. The prize is a whole lot of food. They are playing a group of orangutans. Do they stand a chance? Read the book to find out. The three monkeys and their friend the gorilla wanted to visit the circus in town but the three monkeys only had sixteen cents between them and the gorilla only had twenty-seven cents. It would cost them four dollars to get into the circus. Will they be able to go? How will they get in? Hooey woke up thinking he was going to have a wonderful day because the sun was shining brightly. It seemed from the minute he slid down the tree and got a splinter, then got bonked in the head with a coconut that his day was not going to be so great? What do you think? Will he have any blessings to count? Tale 4 – Can’t Miss This Mess! Hooey was a messy monkey. Booey was always telling him something bad was going to happen if he didn’t clean up his room. Read this wonderful tale to find out just what could and did happen. It is Fooey’s birthday and his sister Booey made his delicious cake. But what happens when he tries to blow out the trick candles on his cake? What special gift does he want from Kabooley? Kabooley took the monkeys to the rodeo. Hooey had a surprise for Kabooley. He signed him up to ride the big brahma bull. He only had to stay on for ten seconds to win a hundred dollars. Do you think he can do it? Tale 3 – Fooey’s Best Day Every Day! The day after Fooey’s birthday he was sad. He wanted to have a birthday everyday and not have to wait 364 days until his next one. His brother Hooey and sister Booey come up with a great idea. Can you guess what it is? The three monekeys set out for a picnic. They walked and walked to find the perfect place to have a picnic. They wanted a place no other animals would try to eat their food. Do you know where they had their picnic? Kabooley the gorilla came by the monkeys treehouse to take them on a hot air balloon ride. Read along to see what great adventure they will have. When Kabooley doesn’t come around for several days the monkeys set out to find him. They find him in his house very sick. Read to find out how they help their friend. When a big storm coming from all directions heads for the treehouse, guess who comes to help the three monkeys stay safe? The hippos get a really special visitor from North America. Can you figure out who would visit them? Kabooley visits the monkey and tells them about something special he bought in Coconut Town. Can you guess what it would be? What will happen when he lets the three monkeys try it out? This last tale is a remake of Mother Goose Nursery Rhymes into Mother Monkey Nursery Rhymes. The author has done a fabulous job recreating them to fit the monkey theme. Booey, Hooey, and Fooey are three monkeys who live in the jungle. One day they received a package from their uncle. It was full of decorations for a Christmas tree. They set out through the jungle to find the perfect Christmas tree to decorate. When they realized there were no Christmas trees in the jungle they came up with the perfect solution. Can you guess what it was? It is Christmas and the three monkeys wanted to go to Coconut Town to buy themselves Christmas presents. They meet their new neighbors who will have nothing since the father is in the hospital. Will they be selfish and buy themselves gifts or will they discover what the true spirit of Christmas is? 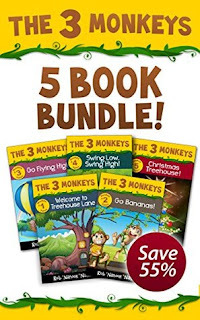 In this tale Grandpa Monkey is telling the three monkeys the story of Sunny Paws who delivers candy and presents to all of the jungle animals. The songs that accompany each story is really a fun take on a familiar song. In this story we find the three monkeys and their gorilla friend making New Years resolutions. What kind of resolutions do you think they made?